I’ve fully embraced the fact that I’m addicted to salt and crunchies. To preen me away from a jar of anything picked is like separating a mother bear from her cub. Please don’t get between me and my precious jar of pickled vegetables. Just don’t even think of going there. OK?With that submission to salt made clear, I’m blaming it all on my Vietnamese heritage because I pretty much started at birth (once I moved to solids) to eating pickled foods as part of my meals. The colorful collage of Vietnamese cuisine includes fresh textures of raw herbs/greens and often bright and crunchy pickles of some sort. I love eating my food in layers, where I have the luxury of biting into a pickled accouterment alongside savory grilled dishes, or tearing fragrant raw herbs into my hot bowls of brothy soup. Each bite of Vietnamese food is exciting because of the diverse contrast of cool, crunchy, sour, sweet and salty textures. Our pantry and fridge are continually stocked with pickles from our garden vegetables and when I’m low on staples such as Vietnamese pickled carrots and daikon, I’ll forage my veggie plots for new replacements. But this year, the daikon plot is taken up with fresh spinach, so all I had to pickle were the carrots. That’s fine by me because pickled carrots are still perfect as a single accompaniment. I kept it singular and simple. 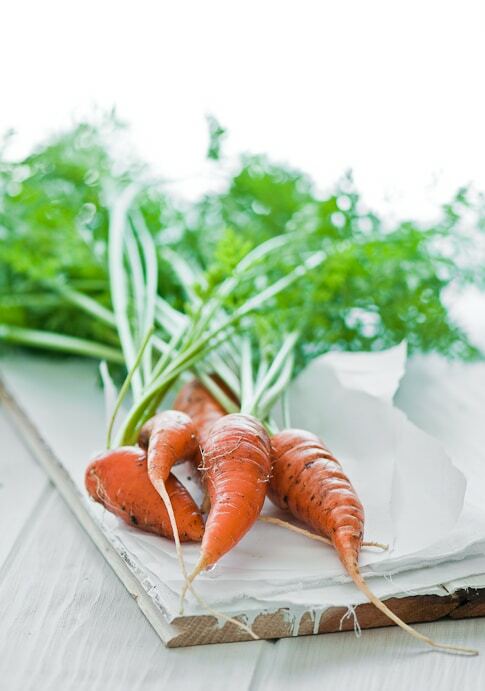 The carrots by themselves are equally divine and versatile! 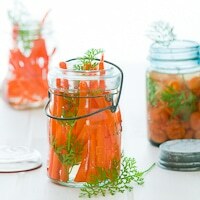 When we first started the blog, one of the first recipes put up was my staple Vietnamese carrot and daikon pickles recipe. But last week I wanted to try a different recipe and I found it in a gorgeous new book by Janet Fletcher called Eating Local: The Cookbook Inpsired by America’s Farmers. This lovely cookbook is a farmers markets dream because the every single recipe had a fruit or vegetable included in it and perusing through it is like walking the stalls of our local farmers markets. Each page is bursting with fabulous produce and it’s like visiting a stand from a favorite farmer. The color, freshness and appeal of every recipe is a proud reminder of why so many of us try to eat local and support our farmers. 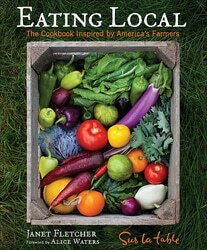 Eating Local also takes readers on to the land and into the homes of 10 of America’s best small farmers as well. Their stories instantly connect all of us all to this vast food chain of eating locally and sustainably. I’m really looking forward to cooking from this cookbook because there’s recipes in here that can allow me to create a complete meal from fresh produce. A few days of vegetable meals isn’t a bad idea and my body is craving for that lately. Since I only had carrots growing in my garden and no daikon, I simply replaced the daikon half with carrots. Use any ratio you wish for the pound of veggies. Next time, I’ll have to try just pickling daikon! Wash daikon and carrots and cut into matchstick sizes, or round sizes (about thickness of a 25¢ quarter). Pat dry. In bowl, mix vinegar, salt, sugar and water until the sugar dissolves. Add the carrots and daikon to the mixture and let marinate for at least 1 hour before serving. 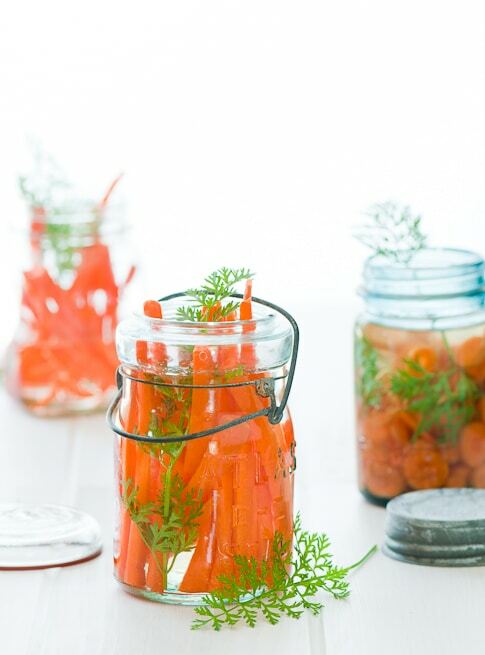 For best pickled flavor, store vegetables in an airtight mason jar for about 5 days in the refrigerator. Recipe Note for Salt: All recipes containing salt are based on kosher or sea salt amounts, not table salt. If using table salt, reduce the amount used to taste.